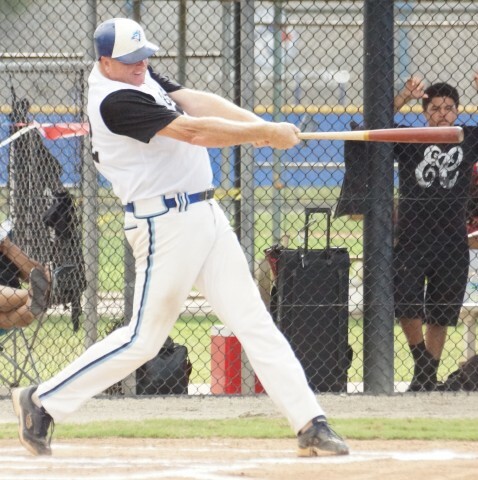 The Men’s Senior Baseball League Fall Classic got underway on Monday at the Toronto Blue Jays and Clearwater Philies Florida Complex’s. Pictured is former Blue Jays farm hand Keith Felden applying the tag at the Mattick Complex. Felden, a Blue Jays third round pick in the 1985 January Supplemental Draft out of St. Pete College, is a Clearwater resident (Clearwater High School) playing for the Clearwater Black Sox. Speaking on the present Mattick, Felden called it “Amazing,” this coming from someone who as a kid played at the old complex. Every team does get to play at least one game at either Bright House Field or Florida Auto Exchange Stadium. A new set of MSBL teams starts play next week at the two complexes.